Watcharee Thai Sauces eGift Cards are distributed by Squarespace, Inc.
Watcharee Thai Sauces eGift Cards are redeemable for merchandise at our online store at www.watcharee.com/our-store. 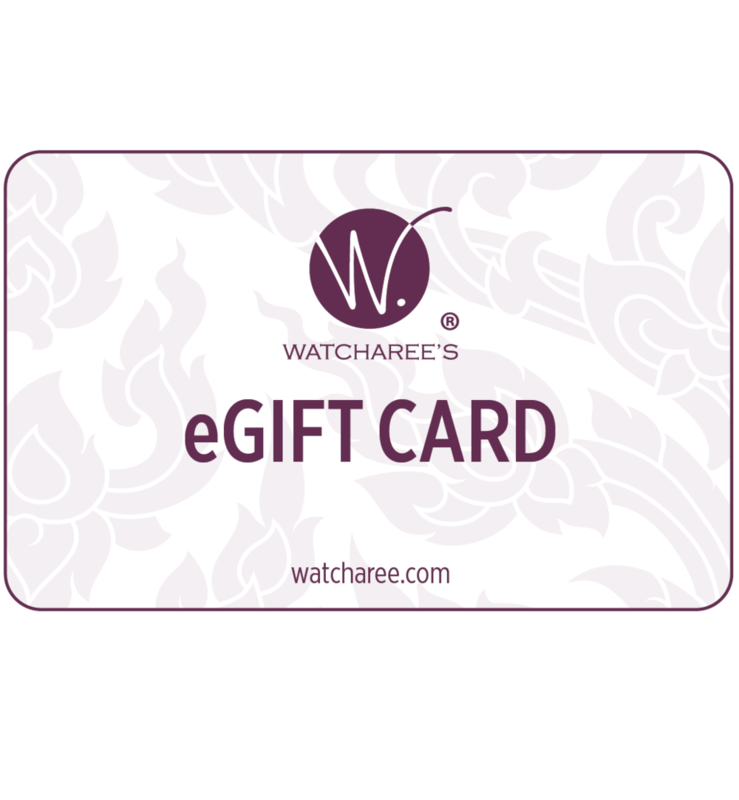 Watcharee Thai Sauce eGift Cards are available for purchase here. To view eGift Card balance, the recipient will receive an initial email with the gift card balance. After entering the gift card code at checkout, they will see the remaining balance, if any. Recipients may return products purchased via eGift Cards. Refunding a purchase made with a gift card adds the refunded amount to the gift card's balance. If you suspect that someone has copied or stolen your eGift Card, please contact us immediately at info@watcharee.com. eGift Cards will be resent to you within 48 hours. If the eGift Cards are lost or stolen, purchasers must provide confirmation email as proof of purchase. Ownership and risk of loss of eGift Cards passes to the purchaser as soon as we send our confirmation to the recipient. We are not responsible for lost or stolen eGift Cards. Watcharee Thai Sauces eGift Cards may be paid for with a valid VISA, MasterCard, Discover, or American Express. All orders of eGift Cards are subject to a process that compares purchaser information provided on our website with information about the purchaser provided by the purchaser's financial institution. If there is a discrepancy, your eGift Card order may be delayed until it can be corrected. If a spam filter is blocking no-reply@squarespace.com emails from getting to an inbox, the email options will need to be modified so that no-reply@squarespace.com emails are not considered spam. If you need further assistance, contact info@watcharee.com. Please refer to your order number, or be ready to supply your email address. If you wish to add a personal message to an eGift Card, simply type your message in the Message field on the Gift Card preview. Personal messages are limited in length to the space provided on the eGift Card. There is no additional charge to include a personalized message. We do not read every gift message, but if we do find inappropriate, offensive or otherwise objectionable messages, we reserve the right to cancel them. Thanks for your cooperation.